The PAWS Team are delighted that "Orthopets.co.uk" have kindly agreed to make commission donations on any of their mobility solution purchases made via our website or FB page. Orthopets are industry leaders in custom fabricated veterinary orthotic and prosthetic solutions. Their mobility aids are designed to help dogs with problems ranging from mild joint instability, to paralysis, or missing limbs. PAWS volunteers have been using orthopets harnesses and slings from time to time on their own hounds for many years and these products come highly recommended. Orthopets products are available to fit all shapes and sizes of dog - and they can also provide custom solutions where necessary. Please click on the link to access the Orthopets website - thank you! 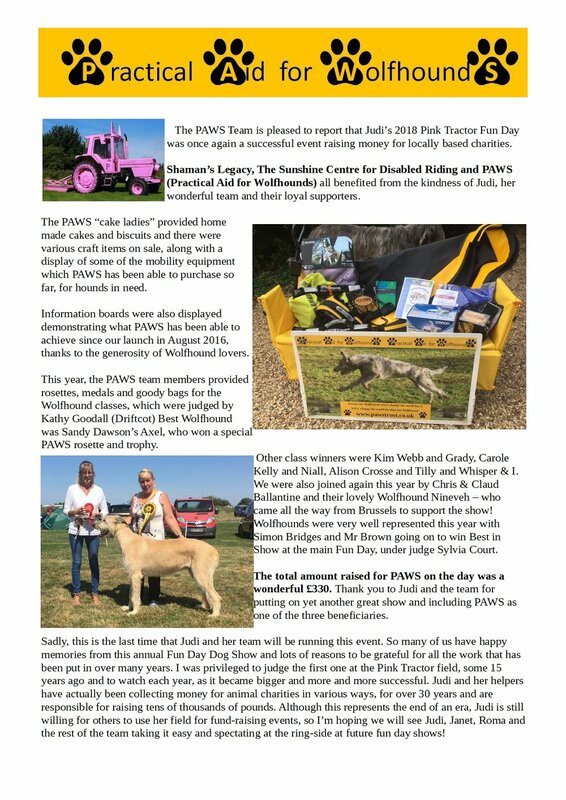 The PAWS Team are delighted to be one of the chosen charities to benefit from Judi's Pink Tractor Fun Day this year. Wombat's Wheeling for Wolfhounds a Whopping success! Pedal perfect Tom Perrott pushed himself to the limit this weekend for PAWS and completed the Dorset Gravel Dash! Not only does this represent an amazing personal goal in Tom's fight for fitness - it also means that thanks to his generosity - and that of his supporters - Tom has raised a wonderful £835 for PAWS! Not only did he reach his target amount - he smashed it! Thank you to everyone who donated. 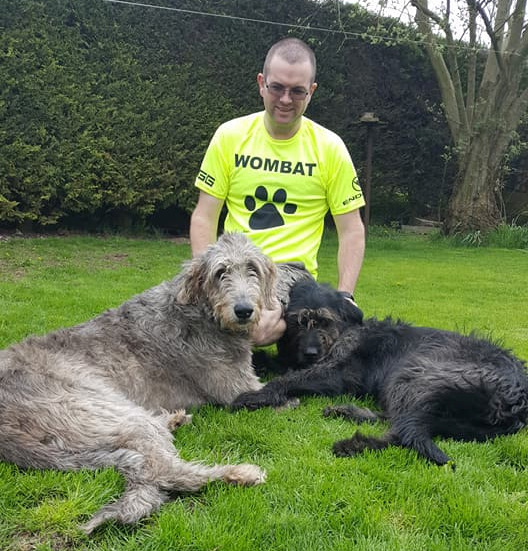 This is well in excess of his original goal of £250 and means that we can buy mobility equipment for Wolfhounds in need - not just for Tom's own region - but for pretty much every region in the UK. This is a fantastic achievement and the PAWS Team would like to thank Tom for his kindness in thinking of PAWS as his chosen charity. Huge congratulations to Tom for completing the course and a massive thank you to Rosi, "the furry ones" and everyone who has supported Tom throughout his training. Well folks - there's just two days left before Tom "Wombat" Perrott sets off on his epic journey raising money for PAWS. Tom has put a huge amount of effort into this event. He has trained so hard and worked with his medics to make sure that he and his bike are set up perfectly. He has also put in a lot of work with publicity and promotion. A massive thank you to everyone who has donated so far towards helping Tom reach his goal. He still needs another £100 to get to his target of £750 - so please let's try one more push to promote pedalling for PAWS and help lift Tom to a worthwhile weekend's wheeling. Good Luck Tom and thank you! Tom's "Tour de Dorset" - just one month 'til push off! 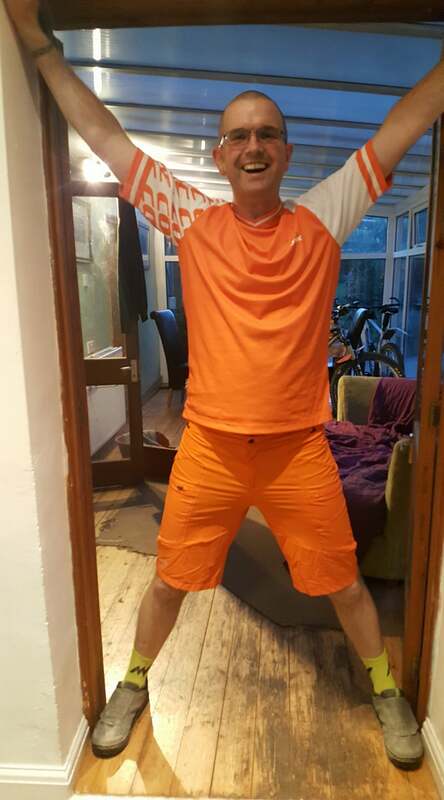 There's just one month to go before Tom Wombat Perrott sets off on his epic two day bike ride, rasing money for equipment for PAWS - South West region. FANTASTIC NEWS ON BJORN THE BEAR! Bjorn is now recovered! 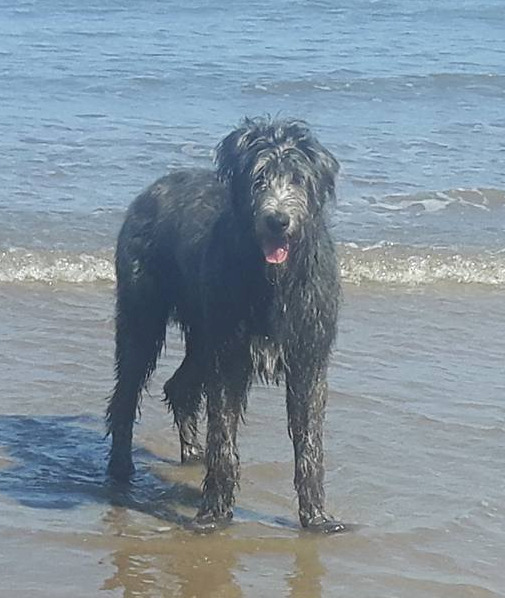 Here he is enjoying a paddle in the sea! Well - 12 weeks have gone by since Bjorn underwent an operation at Abbey House Veterinary Hospital, to repair his liver. Yesterday, he had the blood tests to check how his liver is performing and I'm delighted to let you all know that the results just came in and his liver is functioning normally. He has a clean bill of health! The PAWS Team are so grateful for the huge support received - especially from "The Irish Wolfhound Community" and "Wolfhound Bling!!" Facebook pages. Training is progressing well - and donations are coming in! ~ Just a quick update to thank everyone who has so far sponsored Tom's up-coming bike ride. He's already exceeded his original target of £250, so he's going to set a new target of £500! The amount already raised is enough to buy a full body lifting harness, a set of protective boots, a toe-up sling and a ramp! Woohooo!!!! The next target will be to raise enough to buy one of our specially designed stretchers. 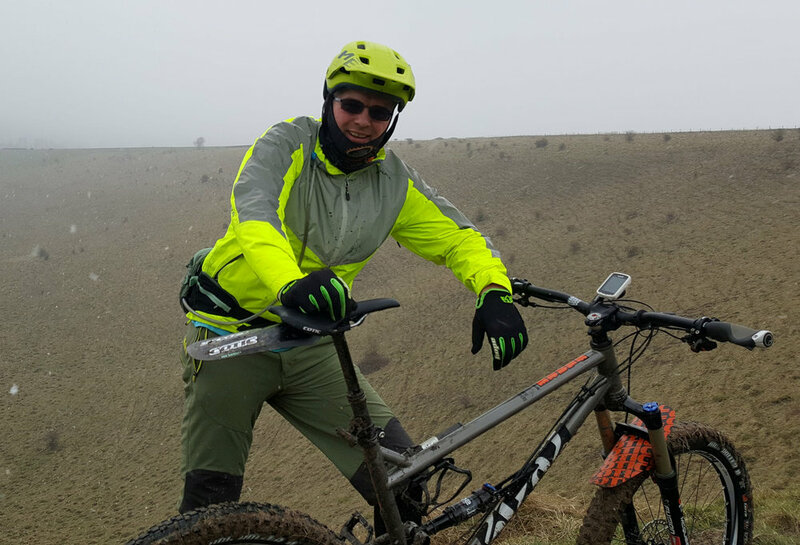 One of our “Helping PAWS” - Tom 'Wombat' Perrott - is aiming to raise money to buy mobility equipment for the south west area, by taking part in a 100 mile off-road cycling event. Tom says:- “Like many, I struggle with chronic pain in the lower back. I try to avoid medication and last year it was suggested I had a go at cycling. So having got somewhat hooked on the sport I thought I should look to challenge myself. So 100 miles over two days around Dorset off road will do nicely. For many it's a breeze, for me with my back ……... well, best I get training and find a comfy saddle! To support Tom’s mammoth effort – please visit his fundraising page on Golden Giving where you can follow the progress of this fundraiser. The PAWS Team are really excited to let all Bjorn's friends know that he is home! He has had wonderful care at Abbey House Veterinary Hospital in Leeds. As you can see from his photo, he's really happy to be back with his family and in familiar surroundings. 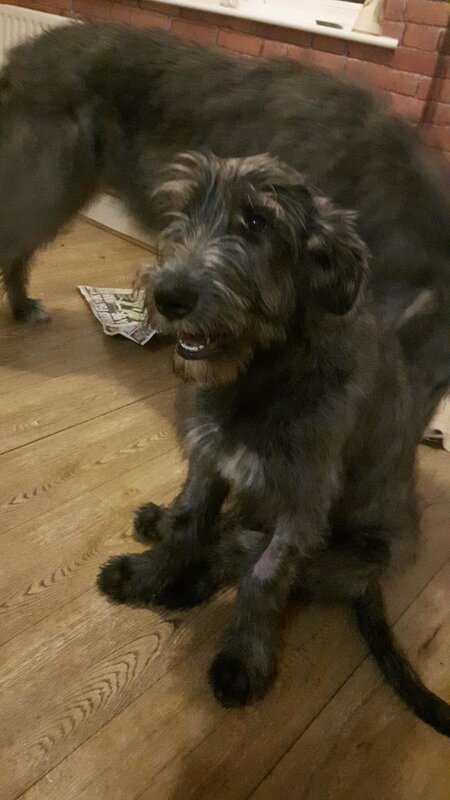 We would like to say thank you once again to "The Irish Wolfhound Community" and "Wolfhound Bling" Facebook pages, whose wonderful supporters have made Bjorn's operation possible. Thank you to everyone who has supported him & his family through his illness, major op and recovery. I'm sure he will continue to go from strength to strength.